SUNNYVALE, Calif.--(BUSINESS WIRE)--PMC-Sierra, Inc. (PMC®) (Nasdaq:PMCS), the semiconductor and software solutions innovator transforming networks that connect, move and store big data, today announced that Memblaze Technology Co. Ltd, a leading provider of flash storage solutions, is utilizing PMC’s Flashtec™ NVM Express (NVMe) controllers in its next-generation PCI Express® (PCIe®) flash accelerators. The Flashtec-based Memblaze PBlaze4 products are targeted at hyperscale and Open Compute Project deployments. They provide ultra-low latency and the lowest CPU load in the industry, with read and write capabilities of up to 850,000 I/Os per second (IOPS) for random read and 265,000 IOPS for random write and 3.2GB/s sequential read, 2.5GB/s sequential write performance. Memblaze products enable its customers to define and alter key settings to ensure optimum performance in specific applications and platforms. SSDs based on PMC’s Flashtec NVMe controllers provide the highest performance, capacity and reliability. The flash memory controller family includes 16-channel and 32-channel devices to enable SSDs with up to 8TB of storage and performance up to 850,000 IOPS, two times greater capacity and performance than other controllers. Dual port functionality delivers high availability for enterprise-class application support, redundancy and sustained uptime reliability. 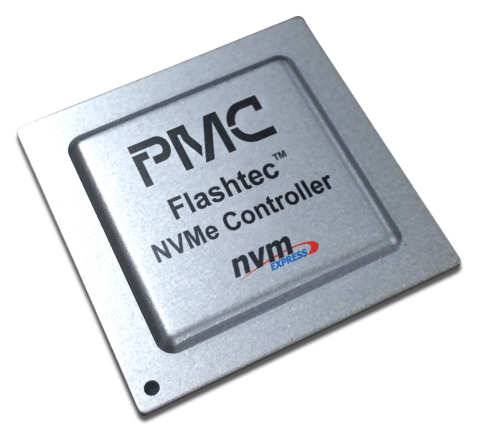 PMC’s Flashtec controller family supports the industry-standard NVMe interface, multiple NAND vendors and all common device drivers, enabling and accelerating wide-spread deployment of PCIe-based SSDs in cloud data centers and the enterprise. Note to editors: Memblaze and PMC will showcase the new PBlaze4 flash accelerator at PMC’s Flash Technology Forum at the Wenjin Hotel in Beijing, China, on December 3, 2014, from 1:30 to 5:00 PM CST. Speakers from both companies will join Sina, Inspur and China Telecom to discuss the latest innovations and use cases for deploying flash to accelerate storage in China’s data centers. Follow the event on Twitter using hashtag #PMCFlashtec. The mission of Memblaze is to make data processing faster and smarter. Traditional storage devices are struggling to adapt to the demand for high speed data processing. Memblaze is committed to tackling this challenge by offering high-performance solid flash storage products and solutions. For more information, visit: http://www.memblaze.com/en/. PMC is a leading provider of enterprise storage system solutions for networked and server storage applications, with a broad portfolio of Adaptec by PMC® RAID adapters and HBAs, Tachyon® SAS/SATA and Fibre Channel I/O controllers, RAID controllers, Flashtec™ PCIe flash controllers and NVRAM drives, and maxSAS™ expander and FC disk interconnect products. Together, these products provide end-to-end semiconductor and software solutions to the industry’s leading storage OEMs and ODMs and hyperscale data centers. For more information, visit http://www.pmcs.com/storage. © Copyright PMC-Sierra, Inc. 2014. All rights reserved. PMC, PMC-SIERRA, TACHYON, ADAPTEC and Adaptec by PMC are registered trademarks of PMC-Sierra, Inc. in the United States and other countries. PMCS and Flashtec are trademarks of PMC-Sierra, Inc. PMC disclaims any ownership rights in other product and company names mentioned herein. PMC is the corporate brand of PMC-Sierra, Inc.
Memblaze Technology Co. Ltd, a leading provider of flash storage solutions, is utilizing PMC’s Flashtec™ NVM Express controllers in its next-generation PCI Express® flash accelerators.